Not long after Xehanort met his end, Sora met with disaster... One fateful night, his home on Destiny Island was set upon by an unknown group of assailants. It was a massacre. When Sora’s room was investigated, it was found in shambles, more so than the others, his bed split into several pieces, and, like the other rooms, soaked in his blood. Judging from the state of things, he had put up a good fight, but must had been overwhelmed. 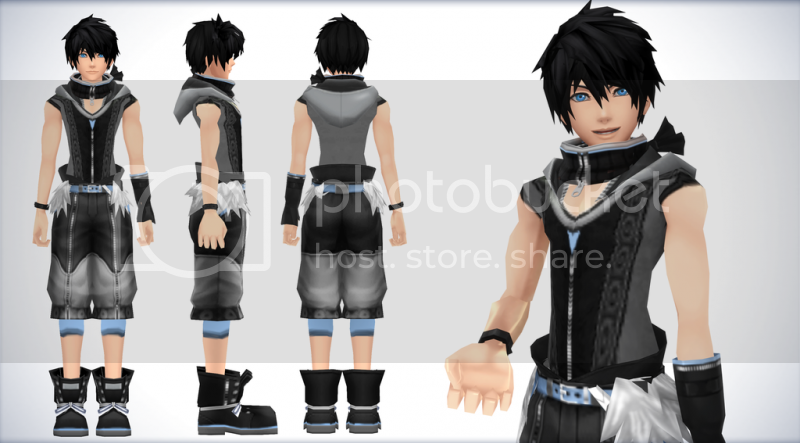 The only recognizable thing of Sora’s that was found was his glove, his hand still firmly inside. The worlds wept the next day, as what few remains of the keyblade master that were found were cast off to sea in a beautiful casket. Eight, peaceful years passed. Keyblade Masters old and new began appearing across the worlds, passing along the knowledge and responsibility of the keyblade on to a new generation of students. The worlds, while not connected to each other physically, but in spirit and in knowledge, created crossroad worlds between themselves, which all flourished into great and prosperous cities. These crossroad worlds acted as a middle point between worlds, allowing for commerce between worlds, the creation of worldly alliances, travel between different worlds, and much, much more. By the end of those eight years, the number of keyblade wielders had grown significantly and the worlds were all connected in a great web of peace and advancement. And while the Heartless and Nobodies continued to exist, their numbers dwindled at a substantial rate, lower than thought possible, due to the combined efforts of the numerous keyblade wielders and the worlds’ heroes. With the Heartless and Nobodies no longer a looming threat and the worlds’ prosperity, the worlds had truly reached a Golden Age. However, the prosperous worlds and their joyful inhabitants could not have been prepared for what happened next. A large number of highly-claimed keyblade masters led their followers to attack one of the great crossroad cities, claiming countless innocent lives in the process. When questioned by the survivors, the keyblade masters smiled and stated boldly that they were simply bored. News spread like a wildfire of the 'bored keyblade wielders' who killed and attacked for sport, and a dark stain was embedded into the reputation of all keyblade wielders. As the keyblade masters continued to cut a bloody swath through the worlds, fear grew heavy in the hearts of the innocent, a fear that was eventually extended to all keyblade wielders, both bad and good. The Worlds' Army was sent against these keyblade wielders in hope of ending their rampage, but fell easily to their superior might and magic. All but the greatest keyblade masters of that era were cut down, with the former, led by Riku, Aqua, and King Mickey, finally forcing the evil masters into retreat. It was a war of attrition, to be sure, and if kept at that rate, the Worlds' Army would eventually defeat the keyblade masters. However, the casualties and damages continued to pile up after nearly two years of conflict and terroristic attacks, and if this war was allowed to run its course at its rate, by the time the keyblade masters fell, the worlds would be in shambles. That's when he appeared, the Eclipse King. Gowned in black robes and impressive armor, the Eclipse King promised a solution to the problem; a solution that would solve the current predicament, a prevent any future ones from ever occurring again. To capture or kill all the keyblade wielders. While many protested, the recent events swayed the hearts of many more, feeling that, with no threats to the worlds, the keyblade wielders themselves would--and already have--become a threat themselves. In exchenge, the Eclipse King asked for the worlds to lend their power to him, so that he might deal with the threat at hand and establish a method to keep the worlds forever safe from such attacks. Though most were hesitant at first, the worlds slowly began to accept the Eclipse King's terms, their worlds suffering from the constant attacks, and forfeited their power to the king. With more than half of their worlds now backing him, the Eclipse King began what is now know as the Black Dawn Genocide. In a swift and bloody strike, a massive army of robotic constructs known as Reavers laid waste to the keyblade masters' strongholds, and great warriors of unprecedented strength fell the masters within the week. The worlds cheered for their savior, the Eclipse King, for ending the threat of the evil masters. And he was good to his word, as well, and began capturing and imprisoning keyblade wielders, the fear embedded into the hearts of the innocent by the evil masters overflowing into a fear of all wielders. As the two years passed, more worlds joined the Eclipse King's Worldly Alliance of the Eclipse Kingdom, confident that, under his rule, no more harm would befall the worlds. What was left of the keyblade wielders gathered at the lost world of Disney Castle, hidden from sight by powerful magic, and joined forces with the great masters to form Mickey's Rebellion. However, with the worlds united against them with a deep hatred embedded in their hearts, resistance seems all but futile. Kingdom Hearts Eclipse will be a unique project, in that, while there is one, overall setting, there can be numerous roleplays set in it, each following a different group through their travels in the story. Though each roleplay may seem separate, actions committed in one roleplay will affect the whole. For example, while Group A is sneaking through Radiant Garden, Group B could be in conflict at Traverse Town, resulting in heightened watch in Traverse Town when Group C arrives and a sudden meeting of Eclipse Army members at Radiant Garden, making it significantly harder for Group A to move about the world. While the first roleplay, led by my character, will seek to overthrow the Eclipse King, do not feel obligated to follow that path. Each roleplay is allowed to have separate goals and methods, including things largely not connected to the major conflict, such as trying to hide from the Eclipse Army or laying waste and robbing worlds. It is meant to largely be an "open world" roleplay that aims to allow the roleplayers as much freedom as possible. Though only mine for the time being, this will eventually list all the active groups currently making their way through the story, and will link to each respective roleplay. Further, it will include each group's main goals or interest, as well as the characters that are currently in that group, and much more. Information concerning how these "adventures" are started will be expanded upon later, in the Info section. Sometimes known also as the "Worldly Alliance of the Eclipse Kingdom" or the "Nation of Worlds," with well more than half of the worlds allied to it, the Eclipse Kingdom is the de facto ruling government of the worlds. Though it appears as a benevolent power wishing to protect and to maintain order and peace throughout the worlds, secrets run deep within its power, showing that there is far more to the Eclipse Kingdom than meets the eye, and little of it good. The mysterious man who quelled the destruction and established order through the formation of the Worldly Alliance of the Eclipse Kingdom. A savior to many and a tyrant to the rest, the Eclipse King is the one responsible for the Black Dawn Genocide and the subsequent capture or extermination of the vast majority of keyblade wielders. As the kingdom's ruler, the Eclipse King wields the power to back up his position, and exerts incredible strength and magical ability to reinforce his position when necessary. Mechanical constructs that fight alongside the kingdom's common foot soldiers, the Reavers make up the majority of the Eclipse Kingdom's front line and base power. Unhindered by physical limitations such as hunger, emotions, fatigue, or pain, Reavers, especially in a large quantity, can make for quite the dangerous foe. The Guardian Reavers are the strongest Reaver model in the Patrol Series. Despite this, the Guardian Reavers are least common of the patrolling Reavers. This is due to the fact that the Guardian Reavers primarily act as leaders of the other patrolling Reavers. The Guardian Reaver stand upright, normally on two legs (though sometimes four), and have two arms (or occasionally four). However, this is simply the basic model, and many different variations exist. Their arms and legs are bulky and heavily plated, causing the Reavers to lack speed, but excel in defense. A weapon is commonly mounted onto one of their arms, normally a sword or a gun, in place of a hand, while the other arm may have a shield, another weapon, or possibly nothing. The Reaver's heavily plated body is large and spherical in shape, with an eye mounted either on the top of it's body--inside what appears to be some sort of helmet--or positioned at the front of the body, inside the outer armor and protected by a lens. In some cases, the Reaver's back will have a weapon, namely a cannon, mounted to it. The Scuttler Reavers are the common "foot soldier" Reavers and regularly appear in great numbers, making them the most commonly seen Reaver. The Scuttler Reavers stand on six, skinny legs that end at a sharp point. The Reaver's body is smooth and crescent shaped, the dome-like top covering the construct's delicate inners. Two red eyes stare out of each side of the head from beneath the armor. The Scuttler Reaver's white, lightweight, but sturdy, armor, allows it to move at great speeds. This Reaver model lacks hands, but has two, razor-sharp, rotating scythes on each side of its body which are capable of cutting down almost anything that gets in its way. The Scuttler Reaver model range in heights, from roughly three feet tall to up to seven feet tall. While on patrol, the Scuttler model normally travels in a group of three to four, so that it may better defend itself. The Roc model patrols the skies and often acts as a spy plane. Aside from their regular patrolling, Roc Reavers also track people, making sure that the ground Reavers do not loose them. As the name would suggest, the Roc Reaver model is a sky model and would thus be equipped with parts to help travel through the sky. For the most part, Roc Reavers look similar to a dragon. Two, large wings take the place of arms, but have blades attached to the ends of them, allowing the Roc Reavers to defend themselves and help maneuver through the air. Their rust-colored body is cylindrical and ends in a long, barbed tail. The Roc model have two legs, ending with talon-like feet with a thruster built into the middle of them, allowing the Roc model to take flight and stay in the air. Without these thrusters, the Roc model could do little more than glide. The Roc Reaver's head, which it attached to its body by a long, flexible neck, is round with two spikes pointing out from the front and another crescent-shaped spike extruding from the top of the head and flowing backwards and up. In between the two spikes is a red eye. The Carriage model was created with one goal in mind: the transportation of and steady output of Reavers. As such, it was not equipped to handle combat and, aside from a few guns along the top, does not have any weapons. During a military conflict, the Carriage model is packed full of Reavers, roughly two thousand or so, as the initial strike force, which it releases upon landing. The best description of the Carriage model would be a very large, flying fortress. The "fortress" is circular in shape and appears as if the main body of the Reaver is surrounded by a wall, which covers up the center and fifty percent of the Reaver. The top of the Reaver appears like a miniature metropolis, with a "building" in the center rising higher than the others. A half dozen anti-air guns surround the miniature city and is the Reavers only means of defending itself. Upon landing, the Carriage model opens a small section of the wall that surrounds it, which is followed by a stampede of Reavers pouring out from within the Reaver. Once the strike force had completely exited from the Carriage model, it begins to take its second form. The wall that surrounded the Reaver lowers to the ground and pushes the main bulk of the Reaver upward until the edge of the Carriage model's main bulk and the top of the wall meet and join. The Carriage model then takes its second form: an actual fortress. Though technically its own model, the Sporer model is normally considered apart of the Carriage model, since one (or on occasion two) are always inside of them. The Sporer model is completely defenseless, though since it is normally inside of a Carriage model, it doesn't matter much. The Sporer model is rather simple looking: Its slate grey body is circular and looks little more than a small platform. The middle of the body glows a strange, bright white. The Sporer model has three, black legs, two on each side and one in the back, which it mainly uses to hold onto the object with the claws on the bottom instead of walking. Its black head is long and slender, looking similar in shape to a bird's skull, and has two, green, beady eyes, one on each side of the head. The Sporer's only job is to teleport Reavers from its twin Sporer model at the base of operations to itself. Since it is able to transport a Reaver completely roughly every five seconds, it is able to keep a rather nice flow of Reavers in whichever world it is currently in. An interesting note concerning the Sporer model is that they are built as twins per Reaver. The teleportation of Reavers can only take place between these twins and, if one of them are destroyed, the other becomes completely inoperable, forcing both twins to be replaced. This is a safety measure by the Eclipse Kingdom to prevent the enemy from using a Sporer Reaver to their advantage. The Cage Reaver is a greatly feared Reaver, not because it has any great weapons or power, but because its presence always indicates doom for an unfortunate soul. Due to its use, which is to capture and transport people, the Cage model is manufactured in small amounts. The Reaver's six, long limbs holds its rust-colored, spider-like body up roughly two feet off the ground. The bottom of the legs are flat, instead of a point like Scuttlers have. Two shorter arms are attached to the construct's front, a massive claw sitting at the end of these arms, which gives the Reaver a cross between a spider and a crab appearance. A large, green eye peers out front of the Reaver's circular head. The construct's most obvious characteristic, hence the name, is the large cage built onto it's back. The cage is extremely sturdy and is opened by a latch at the top, which the Reaver opens with its claws. A rebellion faction comprised of many who were considered 'the great heroes,' namely those who were involved in the conflict with Xehanort. The rebellion, as its name states, is led by the ruler of Disney Kingdom, King Mickey. Those who join its ranks mainly do so for one of two reasons: either they are a keyblade wielder seeking asylum or they aim to overthrow the Eclipse Kingdom. Due to their actions, anyone known to be affiliated with the rebellion is instantly deemed a threat and becomes targets of the Eclipse Kingdom, no matter the extent in which they may be. As an incentive to help capture keyblade wielders and rebellion members, the Nation of Worlds offer bounties for the heads of these criminals. Though a base bounty of one million munny is issued for all known wielders or those associated with them, it may be raised depending on the projected threat the individual displays. As a result, many bounty hunters have arisen to claim these bountiful bounties. The Buddy System is an idea that has two roleplayers agreeing to allow each other the ability to exert a limited amount of powerplaying on each other's characters for the sole sake of progressing the story. However, this ability is limited only to the events in which a roleplayer is unable to make a post as their character or are absent from the forums for a few days, and are thus halting the progression of the story. This limited release of powerplay is not allowed to be used to make any major decisions in that roleplayer's stead. These are events that occur at the very base of the story, and are a constant in each individual roleplay. These may be things such as the fall of a world, a large battle, or the death of a character (for examples), and can affect individual roleplays in various ways, if at all. When an event of such importance occurs, it will be made note of in this thread and those in other adventures will need to plan accordingly. 1. No godmodding or power-playing, save the Buddy System. 2. Romance is allowed, just keep it within forum standards. 3. The story may be mature at times, so please keep that in mind. 4. There is no limit to characters you can have, you just need to be able to keep up with them all. 5. Activity, activity, activity. It's understandable that life often gets in the way of things, but if you are able to get up a post, please do. 6. Keep the fighting realistic in comparison to other characters. 7. If you are interested in a high-leveled character, such as a Keyblade Master, Warlord, or Remnant, please contact me first. What's the distribution of worlds between the two sides? Like what worlds are under what side's control? It's typically up to whoever visits that world first to decide whether or not a world is under Eclipse rule and to what extent it is. Right now, I'd say there are about 60% of the worlds under Eclipse rule, 35% that have some Eclipse presence (but is still independent), and 5% free of all Eclipse presence. Radiant Garden and Traverse Town are under Eclipse Kingdom rule. Cursed Hinterlands (Black Cauldron world) falls under a free world with Eclipse presence. Disney Castle is a world with no Eclipse presence. These are the only worlds at this time that fall under these slots, and other worlds (such as Twilight Town, Beast's Castle, etc.) are open to whichever extent of rule that the visiting party establishes. Such as, if a group decides to go to Halloween Town and are the first to do so, they can decide whether the world is under Eclipse rule, has Eclipse presence, or is free of Eclipse presence. Granted, few worlds would fall in the latter-most, and most would fall under the first, with adventure leaders needing to keep in mind the 60/35/5 ratio in the worlds. Noel’s adventure is a more needed one to help turn the tides against the Eclipse Army. I don’t want to spoil much, but he’ll have an epiphany that will well change how his morals are towards the Rebellion and The Eclipse Army. The Eclipse Army – Marshall of Twilight Town. The gloves are white, while the metal is night black; the metal on top of the hand is crossed with an X and a moon. Noel is a 5'11 young lad with mako green sparkling eyes. Skin tone is slightly a darkened peach cause of his tan. He also has dirty blonde hair, with bangs framing both sides of his face and the length to where it covers half of his eye. (Think Cloud strife but more casual real life looking). His lips are thin and sort uve pink. His build is more of a swimmers body. Noel has well-toned muscles, especially his triceps, Lats, and traps. Although he is pretty built, his frame is light considering his weight is on the light side of 132lb. Possibly cause of his high metabolism, or his harsh training regimen. He wears his custom Marshall uniform which consists of a button dressed shirt that is white with a blue solid line where the buttons are, with pulled up sleeves. His pants are black cargo skinny jeans that reach down to his ankles. His shoes are brown leather steel toed boots that go up to his ankles, perfecting the layer of his attire. Noel is a compassionate man. His duty as a Marshall seems to be different than the other marshals. People assume to rule with an Iron fist. He rules with a golden heart. He takes care of twilight town, and would risk anything to protect the city, and the people that reside in it. He always has a kindhearted smile. People usually associate him as the person who constantly worries about everyone and just wants to live in a world free of any violence and hate. The peacemaker that will fight if needed essentially. Noel grew up in Twilight town an` was just an average day teenager. Although there was a day he witnessed an old woman who had been beat to almost certain death by the guards of the Eclipse Army. Realizing that this is how their so called ‘saviors’ treated them in secret. He decided to enlist in the Army. Wanting to change how the Eclipse Army managed the town’s folk, he graduated at the top of his class being the lightly called ‘prodigy’ of the academy he worked harder than any other. Noel's strength, determination and drive made him a very strong fighter and political leader, even for his age, he is possibly the youngest that has ever graduated. He was even recognized by one of the Warlords, The Warlord even promoted Noel to become the Marshal of his beloved twilight Town. As soon as that happened, he changed how the Army ran their rule. The citizens of Twilight Town stopped living in fear and it became how it once was before the Army even touched the world. I regret not being apart of the first go, so this'll be my chance to be apart of it now. Question though. Can we rp as Keyblade Masters? Or are we only limited to reg. Keyblade-users? The spots are limited, but yes, you can roleplay as keyblade masters, either apart of Mickey's Rebellion or loners or members of another rebellion or whatever. Just want to let you know that I've got a character in the works for this. It'll take a few days though. Everask wields two keyblades that technically aren't even supposed to exist. They are blades created from a mixture of his own essence, and the touch of both light and darkness. When in his folly, he inadvertently reached out to the powers of darkness and they threatened to consume him, the light of his heart sought to balance the damage done to him by the shadow. Thus, these blades were born. Everask himself is devoid of both positive and negative energies, but the blades are suffused with it. Anima, the life of the Heart, is a gorgeously crafted blade of pure white metal with an ebony handle. The Blade itself is fairly long, and of a sleek and straight design all the way to the tip where it curves off slightly in the semblance of a wing, though not quite an angelic one. The Guard of the blade vaguely resembles a heart, and a black double helix is carved into the metal of the handle, extending up to the point of the weapon. There is no keychain, but instead, a pure white substance coats his arm when it is in contact with it. Mortalitas, the death of the Heart, is a wicked thing of jagged edges and cruel colors. It is black with a violet handle. The Guard is vaguely reminiscent of a heart, though upside down. The Blade and handle are both made out of a metal of some kind, though it seems to be in constant flux, as if it is crafted and infused with refined shadow. The point of the blade is almost like a clawed hand with its fingers spread out, and it's reach seems extendable according to Everask's will. There is no keychain, but instead that creeping darkness engulfs his arm when in contact with it. Hand of Folly: A simple physical attack from Mortalitas. When swung, the size and shape of the blade can be altered slightly thus adding more attack power. It looks like the blade turns into a mighty clawed hand that can also grasp at objects and act as a extension of his own hand. Wing of Preservation: Animus expounds a sort of solidified energy to shield Everask from enemy attacks. It is a very durable shield, and is particularly resistant to magic and non physical attacks. Attacks of a dark nature strengthen the shield. The barrier can be shaped and expended in size with varied effort. The longer Everask maintains the shield in one sitting or the most vigorous the barrage of attacks are that strike the blade, the more of a toll it takes on his energy. Loss: A simply named ability, Mortalitas gathers energy at the tip of the blade and then Everask hurls it at the enemy. The shape and size of the energy varies. The more power put into the ability, the slower it moves and vice versa, At the same time, more energy means more material to work with. While it may not be an outstandingly fast attack, the versatility of the maneuver is remarkable. He is capable of shaping the attack into just about any shape he can think of, being capable of distributing the energy he generates. The energy stays in motion as long as Everask's concentration is on it, and just because it hits an object doesn't mean the attack dissipates completely. The more energy Everask uses at once or the more attacks done in quick succession, the more of a toll it takes on Everask's energy. Repentance: When Everask is wounded or takes some kind of damage, Anima can create a temporary patch on that injury. Say Everask is dealt a serious blow. Anima can delay the effects of that blow until the battle is over, or until he gets far enough away that he can treat himself. It's not healing, but more of a way to keep fighting even when it would be impossible for others. Momentum Flux: Using the powers of both light and darkness, Everask is capable of propelling himself at great speeds and moving very acutely and swiftly. Dimension Door: Everask has gained the ability to open doors into darkness, allowing him to move between worlds without the aid of Gummi Ships. Aether: Both Anima and Mortalitas gather copious amount of light and dark energy and force the two together creating a powerful, but unstable third power. The effects of what Everask calls Aether are unclear, but it supposedly destabilizes matter of both the light and dark nature. Gathering the energy takes time, and molding it takes considerable effort, but when it's made, as long as Everask remains focused, it can remain existent. Aether, once released from Everask's control, cannot be halted by any being (even Everask himself) until it dissipates, which doesn't take a terribly long time given its instability. The most dangerous aspect of this ability is the potential for it to backfire if it is somehow disrupted. The ability requires an equal measure of light an dark energy and if it is unbalanced for longer than a few seconds it will destabilize and cause Everask and anything nearby massive damage~. Everask's physical condition changed considerably following the acquisition of his keyblades. His once fair skin lightened to a sun deprived gauntness, granting the boy a deathly pallor. His hair, once jet black is now flecked with gray and white, like that of a man many years older. The boy's eyes are cold and hard like stone, and black like a starless night sky. With excessive use of Mortalitas, his eyes become slitted, feral and shift to an unpleasant, luminous orange. There are tired lines around his eyes, as if he's not slept for days, and his left hand is blackened and somewhat monstrous from touching the corrupted blade Mortalitas. The keybearer stands at about 5'11, and is rather thin. His typical garb consists of a pair of thick black pants and black boots. A white sash is tied around his waist, the end of which hangs to the side, and his shirt is also black, and sleeveless. His arms are covered up to just below the shoulder with either white or black "material" from their respective keyblades. Everask has a straight, defiant posture and rarely ever smiles. Everask is emotionally damaged individual, and yet, Everask possesses the will and determination to prevent the tragedies of his past ruin his future. While some might have sought to pity themselves for their misfortune, this boy decided to forgo pity and work so that neither he nor anyone else would have to suffer as he did at the hands of the Reavers and the Eclipse King. Very little actually phases Everask anymore save for failure. If someone he is protecting is hurt, or if his actions cause innocent people to suffer, it pains him immensely, though of course he wouldn't let it show for very long. No, like everything he just pushes past it, for better or for worse. Physical pain is a trifling thing to Everask. Following the death of his family and the mutilation of his body, there is almost nothing that could cause him real pain anymore. Sometimes, this causes him to act extremely reckless, or to fight long past the time where it would be safe to do so, but he doesn’t care. His body is nothing but a vessel for his ambitions and his cause. Everask lived with his mother, and his twin siblings, Kelda and Roma. They lived in a small town that rarely saw any kind of excitement and was often out of the way of significant events. Word began to spread throughout the town of some sort of conflict relating to the keybearers and the Eclipse King, but no one knew what was really happening, nor did they care. They were sheltered from such things in their separated little part of the universe. It came as a great shock to the towns people when the Reavers came seeking. No one really thought they would ever appear. Some people who escaped would later try to deny that any of it had happened, even though they had seen the event with their own eyes. Everask and his family were forced to watch as their neighbors were taken away by the mechanical horrors. After some time, when they finally came to his house, their objective seemed to change. They seemed to gather around his home as if they'd spotted something that interested them, like wolves sniffing for a wounded animal. Everask helplessly watched as his family was killed before him by the heartless creatures. Everask was next, he knew it. Escape seemed a pipe dream. All he could do was pray for an escape. To anyone who could listen he called out, casting his heart and soul out into and seeing who would respond. Against all odd, something did give him a reply. A massive, heavy consciousness, a dark consciousness pressed into his mind and the power of corruption flooded his form. Through his body, the darkness seeped, as he unconsciously plunged himself into it in his sorrow. With it, he defended himself as best he could, until the reavers in his house were destroyed or distracted. Then he ran as fast as he could away from his home, and slowly, he felt himself began to fade away. The darkness engulfed his mind and body like the blanket of death. If it wasn't for the purity of his heart, and the purpose for which he was to be chosen, he would not have survived that day. Through that suffocating blackness, a small golden while light erupted forth and with it came Anima. The keyblade began to banish the darkness from him, but it resisted. It refused to be extricated so easily. So, like the light, it formed itself into Mortalitas and receded into his arm. Everask became a keybearer, though not in the way he was intended to. From that day he dedicated himself to fighting against the reavers and the Eclipse army with an almost mad fervor. Even if it leads to his death, he vows to devote himself to the cause wholeheartedly. The destruction of Everask's world one of the more brutal assaults instigated by the Eclipse King and yet it was quickly covered up to prevent public uproar. It was among one of the first truly overt actions performed at the hands of the King that the man's organization tried to obscure. To this day it is unknown precisely why the Eclipse King went to that tiny world, but Everask assumes that the Eclipse King somehow knew of his potential to wield a keyblade and sought to eliminate him. The sheer fact that Everask escaped from that world makes him a target, not to mention that he is a dangerous keyblade wielder and a known enemy of the Eclipse King's rule. Alright, so: Noblesse Oblige and FairSovereign are accepted. I'll be getting around to posting Ogen's template up soon, as well as possibly the Eclipse King's. Also, let's go people. No time like the present to get this thing going. OOC: So after reading everything I decided to give this a shot. I decided to go the "originality" route. The Influence of my idea are mainly from Doctor Who/Christian religion. Two of my characters will be keyblade wielders and requesting to make a Warlord character. Time Magic: The earliest form of magic originally used by the extinct race, the Star Angels. Star Eden warriors learned how to execute this form of magic just as skillfully as the ancient race that taught their ancestors. Once mastered, it is said the a "Time Master" can even go back in time or freeze the ticking clock of the universe, it is this reason why warriors born in Star Eden are known as "Time Wizards" or "The Guardians Of Time." and why Star Angels were greatly feared by humanity. Haste (Level 1) - Hope is able to excel his own "Time", once casting this magic on himself his reflex and overall Agility is greatly improved for a short time. This is the basic level all Star Eden Civilization must know. Slow (Level 1) -Hope is able to slow down the "Time" of 1 individual enemy, once casting this magic on enemies the reflex and overall Agility is greatly reduce for a short time. This is the basic level all Star Eden Civilization must know. Hope is cheerful and brave individual who dreams of becoming a Star Eden warrior, his optimism even in certain situations when the odds are against him are one of his strong points, however he finds no shame in running when he's outnumbered or when it's smart to retreat then to fight. Hope also tends to question himself, when he fails to complete a task he becomes frustrated and begins to doubt, it is only with a certain someone help that motivates him to succeed to gain her attention. Hope was born in Star Eden, a planet located in the center of the universe. When Hope was a boy, he played with his playmate who always came over his house from next door, her name was "Faith" and was Hope's first friend and the only one that knows him. The two were inseparable and even assisted each other in practice when they were learning how to use the basic fundamentals of time magic. When Hope turned 13, he surprise Faith by telling her he enrolled to Star Eden Academy to begin his training become a Star Warrior so he can protect her from the heartless. Faith was against the idea, arguing it was enough he was by her side then being far away. Out of recklessness, Hope would discover on his first day in the Academy that Faith enrolled as well, and became immensely popular with the student for her beauty and professors for her intelligence. Feelings shadowed by her achievements, Hope trained desperately during physical combat to earn his professor's attention, but was rank dead last in combat compared to his peers and borderline when it came to his tests. Genesis, Hope's rival for Faith's heart and ranked 1st in close combat in the Academy, was revealed by the academy to be one of the seven chosen "Star Children" that will train to become a keyblade master and inherit one of the original Keyblades of light to fulfill the prophecy left by the Star Angels. This would crush Hope's confidence, to make matters worse there was a rumor the Star Eden councils believe Faith is one of the Seven "Star Children.". Despite this Hope continued to train by himself and indeed improve in close combat and magical ability to protect Faith, now fifteen scoring average grades, his class was about graduate. While his dream was about to be realized, Faith was already training to be a Keyblade wielder and a strong chance they would be separated. Conflicted, this is where Hope journey begins and will realize true strength comes from the heart and self discovery. Long ago during a time when the universe was still in it's early years, there existed seven celestial beings of an extinct race known as "Star Angels". Their own planet, which was said to be all worlds shared as one, was destroyed in the infamous Keyblade war that force them to face the greed of humanity that desired to have control over the light known as "Kingdom Hearts" that was forged by the Star Angels to give mankind hope. Forging "Copies" of the original X-blade to fight, humanity march in the thousands against their overlords for this power. The gruesome aftermath of this war brought many deaths from both sides leaving the seven Survivors of Light to do the unthinkable and destroy their home world and separated the worlds with hope among the stars. To make sure the event never occurred again, the Star angels lock Kingdom Hearts into the abyss of darkness+ known as "The Void" and shatter the Keyblade responsible for so much bloodshed to twenty pieces, seven was kept among themselves while thirteen were turned into "Shadow beasts" hidden in different parts of the universe. Kingdom Hearts would forever be lost for a time and order restored. "If there comes a time when Star Eden faces a great crisis, those of pure hearts be chosen with the mark of the stars to defend the peace and balance of all worlds." Technically: Given the relationship of him and his assigned Princess of Heart, Kairi, and her relationship with Sora and Riku, an 'agent' of Mickey's Rebellion. The Nobody (Sentinel) [14 keyblades, 2 dual-wield and reversed grip, 12 forming his keyblade wings and floating behind him. The Heartless (Striker) [2 keyblades, dual-wielding stance, instinct to protect, not take hearts. The Sentiment (Shielder) [Single keyblade, reverse-grip. Two arrow-rifles, one in off hand, one floating over left shoulder. Battle Serenity: Ability. Time slows to a crawl during a battle in his viewpoint, allowing him to see and react to every move. Doesn't mean he can dodge every one. Final Overture: Turning the keyblade against himself, then twisting it 90 degrees before driving the weapon deep into his heart will result in a spectacular explosion. A literal weapon of last resort, the explosion wipes away any darkness in the area and destroys his heart, in turn essentially killing the Guardian with no chance for recovery. Salvo Striker: Modified form of Strike Raid, using his keyblade wings when summoned, he is capable of launching the keyblades in its wing at an enemy. If he had used his drive form, the other entities may catch and throw it back towards the enemy before returning the blades to the nobody. Since he usually wears his black and blue keyblade armor, he has very pale skin whenever he removes his helmet. With the program weaponizing every aspect of the protector including his heart and emotion, he has a jet-black glass lens covering only his left eye. During times of emotional events, his left eye glows white through the lens. His exposed right eye is ghostly gray, the result of becoming an emotionless protector to serve the light [although during times of kind emotional events, it has been recorded to turn light blue]. His short, regulation jet black hair starkly contrasts his pale white skin. Despite wearing the armor constantly, he is of a rather thin build, a result from acrobatic avoidance training to stay out of sight of the Princess while maintaining overwatch duties. Since isolation and loneliness [that comes with the duty of being a night time protector] is an easy breeding ground for darkness to manifest and take over, training the protector to be lonely and unfeeling while serving the light was top priority. The program was successful for the most part, and as such, basic counter-measures were implemented. As a result, he tends to talk to himself aloud whenever he's alone or thinks he is alone. A stoic, no nonsense soldier/defender, Cody is for the most part what many call "an unemotional, logical... thing." What he lacks in joyous emotions is made up in a fierce determination in his oath, duty, and above all else, the protection and well being of his assigned Princess of Heart. However, behind the cold and logical facade is a shattered, broken hearted kid who yearns for the feeling of sanctuary and to understand the concepts of emotions other than those related to combat, mainly comfort and happiness. The mentality of the whole, this entity is responsible for the general emotion and being. As such, the Shielder is the most cold and logical of the defending trio. A no nonsense, hyperfocused individual, this entity acts as the commander of the trio and usually coordinates their battle plans. He is also fiercely loyal to the princess, follows mission objectives and interpretations of assignments, and in turn keeps the other entities focused on the goals. The body of their whole counterpart, this entity seems to be the best of both worlds. Combining logic and emotions, the Sentinel is the most level-headed of the group and most disciplined. Despite not being the head of the group, he tends to make the most sensible decisions and acts as a general adviser to the Shielder. He also indulges in the spontaneous acts of the heartless, knowing that venting the repressed entity is key to the longevity of the weaponized heartless. Taken up at a young age by Yen Sid, Zero-Four was selected to become a Nocturnal Guardian of Light because of his strong sense of dedication. Remaining faithful to his duties of being a Guardian, "Nocturne" knows nothing else about life when no clear objective or mission has been assigned to him. Deployed to Kairi at the age of 15 to guarantee her safe passage to Destiny Islands before being ordered to go 'dormant' for 9 years, he would have led a tragically lonely and unappreciated life had the Darkness not decided to intervene in the peaceful world of Destiny Islands. Stepping out of the shadows to be a friend in her time of need in CoM, his time with her had him questioning the creed that he so dutifully follows and the warm emotions that he had only begun to feel but what many had taken for granted. After a fateful stormy night and a break of discipline, she was finally able to talk him in to opening his heart and accept as well as cherish the more beautiful side and emotions of life, particularly happiness, love, and sanctuary. With Sora's untimely demise, Nocturne has managed to protect Princess Kairi from external threats, but has been unsuccessful in upholding his oath of "I will do whatever it takes to ensure her safety and well-being. "With the Princess absolutely heart-broken over the loss of her dear friend, he has become distressed in trying to comfort the princess. Javelin, I'm fine with your character. Eightbitred, I'm fine with yours as well, and feel free to make a Warlord character, just know that Warlords will occasionally be called upon by the Eclipse King ("Adventure One" will typically be the roleplay these meetings take place, but it may vary depending on the situation) or given duties to carry out. I have no problem with Star Eden or the Star Angels per se, but the forcing of this as the established history I do. This is basically an entire different story encroaching on this one, and contradicts many core plot-points I developed while constructing this roleplay, which include details such as the keyblade war, its instigator, what Kingdom Hearts truly is, and so on, which the main conflict of the story is heavily connected to. So while I can accept your characters, I cannot accept this "history," as it simply contradicts too much of this story. Honestly the only thing I need to change that doesn't contradict your plot of the story is the Star Angels creating Kingdom Hearts, instead I'll just change it to the ancient race being the guardians of "Door Of Light" that we can assume at one point in time did not have a name. I only went by the CANON history of the keyblade war that was revealed so far, and its entirely possible there are secrets that even the Star Angel race do not know about such as who "Instigated" the war or "What Kingdom Hearts truly is", you did say "Be original." Grappling hook - On her person she carries a tool to help her scale large structures without hassle. Its long chain of about thirty feet, tipped with a sharp point of penetration. When fired it can bring her up to the height of the location as long as it doesn't exceed 30 feet, she's can clear any wall that height. Lady Oum is a skilled shield fighter. He possesses two osbidian shields, lightweight and powerful. Their only single special properties is how they are aerodynamically proportioned when thrown, to always return to her. Her much larger sheild is the color of ashen stone. It's her prioritized line of defense, with a single special trait to become denser to withstand the front of more maleficent attacks. Memory manipulation - Similar to Naminee, but not limited to simply a single person and their connections. Lady Oum is a manipulator of human, inanimate objects, and animal memory. She is able to dabble into a person's memories, first initiated by making eye direct eye contact at least once to establish the connection, once its been made it cannot be undone unless two circumstances happen. [*=1]The first is if her memory of the recipient is tampered with enough that she forgets them, thus breaking the connection established. [*=1]The second condition is if Lady Oum herself releases the hold on the affected recipient's memories. Implanting/Replacing- Lady Oum can replace memories with ones of her own design. The most common example is replacing a figure from the affected's past with one that does not exist or someone allied with or employed by Lady Oum. Erasure/Bury- Lady Oum once diving through memories is capaple of erasing memories. Well the term "erasing" is rather inaccurate, she is capable of removing them, but they are not gone per say. She can isolate them to a locked part of the recipient's body, most commonly confined to their heart to a vault not even they are aware of. Collect Memory- In a similar fashion to burying memories, Lady Oum can also collect memories for herself and archive them within her heart. Often used as a reconnisance tool of study to analyze the actions, past experience, hand-ons on usage of foes abilities, all for the sheer purpose of data. This helps her to better understand friends as well as enemies and the proper measures to take when engaging them in consort or battle. Touch Memory- A very special trait, she is able to see the past when making contact with objects. Usually the objects she touches are significant and hold moments of time when they are held, making them an extension of a human being or animal. These visions of events and actions i the past are often painted to her in first person from the individual holding the object at the time, and these visions usually end within seconds after the object that was held leaves the vicinity of the wielder's hand by about one meter. Kinesthetic-Intelligence- Lady Oum was born and has attuned to a Kinesthetic-Intelligence, having an avid and advanced competence in her muscular movement, cognition of where she fits into space, and superb physical ability and flexibility. Able to break her fall from a maximum height of fifteen meters up. Remarkable muscle-memory, capable of recognizing all vantage points on a castle by touching the surface. Usually free-runs, finds a myriad of ways to manipulate the terrain during a pursuit or an escape. Marksmenship Proficiency - Although she does not handle weapons very often, when required or necessary she is skills with marksmenship of handguns, assualt and sniper rifles, shotguns, and even primitive tools such as a bow & arrow, crossbow, and slingshot. Shield Combat Proficiency - Her primary weapon is a shield, and she's learned to maximize the skills of defensive and offensive power. Lady Oum has also trained in using two smaller shields for a heavy offensive attack pattern, as well as a singular larger shield for a powerful defense. A full height of five feet and seven inches. Bearing the skin of biege and tan mix, bronzed by sunlight, and paled by the shade of clothing. Possessing two green gems as eyes, very stunning when glanced upon. A scar runs horizontally from below the left eye, across the nose, to just beneath the right eye. Her body type is that of an apple, generally speaking her build from the shoulders to hips slope to create a "V" shape. While her shoulders are fairly broader than her waistline. Personality: "If he didn't remember, it is because his heart made the choice to discard it." Oum is a sublime woman full of color in her personality. Empathetic to a degree, and yet many of her encounters with others have spelled disaster. Grudgingly and fairly pig-headed when it comes to oathbreakers and betrayers, it introduces her tendency and malevolence to manipulate those that double-cross her. Her foes know her at her worst, but don't remember anything other than the torment of their bad times in life, and the maleficent memories Oum can instill in them. To her friends she is a reliable and exuberant woman that is at the helm of discussion and prudent-planning. Her sense of initiative and direct make her a very likeable person, she hasn't really any particular interest in intimate relations as no man has moved her in that way of feeling or thought. Her full name is Castiel Isiah Oum, she is the daughter of a simple family of merchants. Originating from the world of eclipse, anyone could easily identify their childhood here as a difficult and dangerous one. The children she knew growing up, were like her in some way or manner extraordinary. However in the world of eclipse there beckoned much violence under the malevolence of the eclipse king as it was his dominion. Unruly were the sweeps of the marshals to recruit worthwhile candidates to be raised within the eclipse king's inner circle. At the tender age of eleven, there was a knock upon the home of the Oum family. A marshal to whom's name was not given, requested an audience with the child of the family. In no position to refuse, Castiel whom crept behind her room watching as this authority figure strummed into her house, eyed cautiously and quite fragile from this stranger. The sound of her father's voice soon reached her, with her door opening rather slowly and cautiously. As her eyes hovered to the floor, she shook a bit and looked up making eye contact was the thing she didn't want to do. This marshal had eyes were strangely orange, he leaned down and patted her head in a semi-aggressive manner. His smug expression, rough face, and five o'clock shadow was to make any man or woman sick to their stomach with such a reputable appearance. Out of fear itsef, her eyes widen and she dove into his head and could see the memories of his past. He was speaking to her, but she was virtually deaf as she navigated through his memories. A disturbed and horrified look had emerged on her face and he noted this with a strange suspicion, quickly dismissed with an arrogant remark of her exasperation and fear. Releasing her head he spoke to her, a proposition, an offer that she was unable to refuse. To be recruited and bred by the eclipse army for her special talents. Humanity is something Oum treasured, and this marshal's singular acts of indecensy and his murderous memories would only lead her to distrust him, but she had no choice. Castiel had ascended to the rank of a marshal, under the tutelage of the same man that had recruited her. He was on the verge of retiring, in her past there was one thing certain, she'd emerged through several indecent acts against her will. Her humanity had been shaken somewhat and a clear conscience became something she sought after. The marshal's name as Archduke, his mysterious power to talk to animals, and control both plant and wildlife. It was only a year later they were sent on an assignment to capture a to be rumored keyblader on a distant world. Toting what looked like a detachable end, but the appearance was unmistakeably key-like. As Oum and Archduke ascended upon the world, it seemed unusually...plain, stark of nature of even inhabitants. As they entered the town, bodies to the left and right of them had been placed in a neat pile, the stench of death evidence of a complete massacre, yet no patrols from foreign crusaders, yet there was a single man that exited a house immeidately being identified as their perpetrator. His hand purged a weapon in a light, that they identified as what looked to be a keyblade. "Archduke, it's a trap! Thats-"
The crushing sound of a limb being severed at the shoulder was heard, as the stranger split through Archduke's bone, amputating his left arm in a single swing, and throwing the hilt of his sword into his throat to asphyixiate him immediately. Oum was terrified, she took a step back and the assailant darted with a rapid step combination appearing as if phantom-like. Bringing a horizontal slash from across her face and underneath her eyes, tearing a wound across her nose. He thrust the hilt into her stomach with such force, she forced up blood and was knocked to slide across the stoned pavement. When Oum came to, she felt her body being dragged along the ground, her hands were tied and her feet were also bound by a rope and being pulled by her feet. Her vision was blurred and still coming around she felt her body contorting against gravity and being suspended as she was layed against something. The sound of yelling, familiar, Archduke's voice? Looking around she saw him stand with a stub of an arm over a stage with the rope fastened around his neck to tower over the bodies, the stranger kicked him off the edge and he fell over to hang to his death, the sounds of his exasperated screams. Oum's ears couldn't handle the sound of him suffocating before he finally ran out of air, the stranger turned around and tugged at the rope that nuced her feet, muttering that this was how the eclipse army would pay for their sins, and that only God would determine the decision of mercy, that he was just a hand acting in his stead. Oum leaned forward attempting to gain her footing, achieved easily with her skills and she lunged forward raising her tied hands up and hammer fist the stranger. He drew his blade unsheathed to parry and she severed her arm restraints in the process. Curling backwards to throw her legs into the same position, she threw him a shockwave of a glance, attacking his active memory, enough to stun him before thrusting her hand into his face. The two fell over and rolled off the very edge of the world and fell into the abyss below, in that time before she'd crawled into his memories and removed the one that seperated him from mindlessly killing to ensure she would be safe. As they'd fallen, she began to loose consciousness again, until she finally blacked out. When Oum finally came to, she'd been in a cottage near the waterfront, she found herself bandaged up but in no true condition to return. Looking down at her nose, she punched the bed angered but humbled to an extent, it would be a while before she'd be doing anything, and the other marshals would surely come looking for her. She's ran from them for the past four years. +Oum uses an item known as a Dark Star, created by the Eclipse King to traverse worlds. It functions in a similar manner to the king's star shard's. +On her final mission with Archduke, the marshal's later discovered his body and not hers. After 3 years of searching, her status was updated from Missing In Action, to Disavowed from her position. +The stranger that killed Archduke and fell off the cliffside with her was also never discovered upon her regaining consciousness and has since eluded by Oum and the Eclipse Army. Honestly the only thing I need to change that doesn't contradict your plot of the story is the Star Angels creating Kingdom Hearts, instead I'll just change it to the ancient race being the guardians of "Door Of Light" that we can assume at one point in time did not have a name. Honestly, it isn't. As for the DtL, that also wouldn't work, as, in my "telling" of the history, the Realm of Darkness did not exist pre-Keyblade War. I only went by the CANON history of the keyblade war that was revealed so far, and its entirely possible there are secrets that even the Star Angel race do not know about such as who "Instigated" the war or "What Kingdom Hearts truly is", you did say "Be original." It's fine to be original. What isn't fine is you taking the liberty to decide so much concerning major backstory plot-points without either asking or discussing it with the person who knows the story's plot. You certainly wouldn't like it if someone popped into one of your roleplays and tried to hijack major points from you without consulting you prior, would you? Alliance: "Side? I am on nobody's side, and nobody is on my side. I am merely a wanderer." Weapon: A plain wooden staff. Ability(s): Unknown, but possibly very powerful. Otherwise, is only a toymaker and traveling merchant throughout the Worlds. His wagon is drawn by a driver, Olum Tobifer, who never leaves the vehicle, save to tend to the donkey (Rie'jenn) which pulls it (the wagon is capable of shapeshifting according the World, and in the Lanes Between, outside of Worlds, becomes a three-masted ship, helmed by Olum). The wagon/vehicle is guarded by a knight in silver armor, known only as Tick-Tock, who wields only a greatsword, and only seems to protect the old wanderer and his troupe. Appearance: Wears plain brown clothing, with a hood attached to his grey-brown coat. Stands at around five feet and eleven inches, usually bowed slightly as he walks. Always has a satchel on his left side containing books and various trinkets, and a waterskin hanging slightly above his satchel, which has a bad habit of leaking, yet never seems to become empty. Bright blue eyes peer from beneath white, bushy eyebrows, and a full white beard hangs to the middle of his chest. Personality: Warm, kind elderly; appears to not like being rushed or woken from his various naps. Bio: "I'm only a toymaker, plying my trade, along with buying and selling from various markets. Be off now, much to seek!" Age: Appears in his middling twenties. Alliance: "His Majesty, the Eclipse King. Who else could I serve?" Weapon: Walks with only a metallic black cane. Ability(s): "What powers? I am only a diplomat of His Majesty. My personal servants may be a bit odd, but one must represent properly, no?" Appearance: Is always garbed completely in black; his longcoat is adorned with buttons of a strange white metal, with red thread running in the hems and edges. Normally wears a wide-brimmed black hat; a platinum ring, with an amethyst set into it, is his only jewelry. Stands around five feet and eleven inches, with dark brown hair, and green eyes. A plain face. His personal servants are dressed similar to him, though they only have plain bronze buttons on their coats, and no red embroidery, nor hats. Personality: "Did I ask for further inquiry? I am busy enough with this trade agreement here; begone." Bio: Unknown, has only been shown to serve the Eclipse King - if not at the beginning of the Eclipse King's reign, surely not long after. Sits only at the rank of Captain; is little more than His Majesty's diplomatic arm - his prowess in battle remains untested, if not unseen. After careful consideration, my character is finished.